eDiscovery efforts are often costly, time consuming and burdensome. The volume of Electronically Stored Information is growing exponentially and will only continue to do so. Even with the advent of technology assisted review (TAR), the costs associated with collecting, processing, reviewing, and producing documents in litigation are the source of considerable pain for litigants. The only way to reduce that pain to its minimum is to use all tools available in all appropriate circumstances within the bounds of reasonableness and proportionality to control the volumes of data that enter the discovery pipeline. Litigators and commentators often pine for the advent of a systemized, uniform and defensible process for custodian self-collection. Conceptually, such an ideal process would be where custodians are automatically presented with a set of their documents and emails that are identified as potentially relevant to a given matter through a set of keywords and other search parameters that are uniformly applied across all custodians. This set of ESI would be presented to the custodian in a controlled interface with no ability to delete documents or emails, and only the ability to review and apply tags and annotations. The custodian would have to comply with the order and all documents responsive to the initial unified search would be collected as a default control mechanism. With X1 Data Audit and Compliance (XDAC), the option for a defensible custodian assisted review (CAR) is now a reality. At a high level, with XDAC, organizations can perform targeted search and collection of the ESI of thousands of endpoints over the internal network without disrupting operations. The search results are returned in minutes, not weeks, and thus can be highly granular and iterative, based upon multiple keywords, date ranges, file types, or other parameters. This approach typically reduces the eDiscovery collection and processing costs by at least one order of magnitude (90%), thereby bringing much needed feasibility to enterprise-wide eDiscovery collection that can save organizations millions while improving compliance. 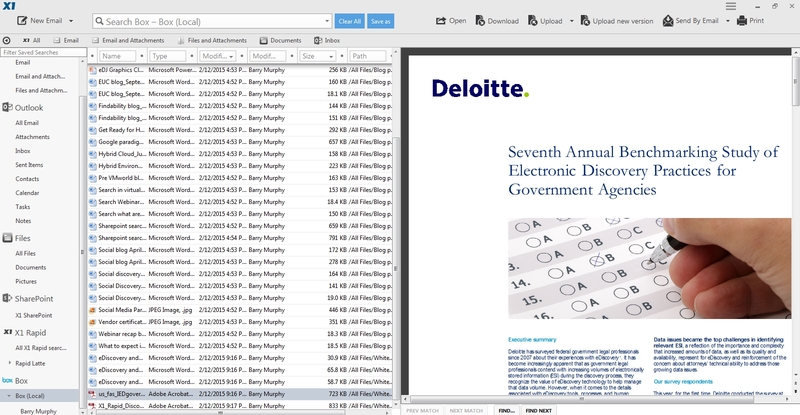 XDAC includes X1 Insight and Collection for pure eDiscovery use cases. As a key optional feature, XDAC provides custodian assisted review, where custodians are presented with a listing of their potentially relevant ESI in a controlled, systemized and uniform identification process for their review and tagging. Instead of essentially asking the custodians to “please rummage through your entire email account and all your documents to look for what you might think is relevant to this matter,” the custodians are presented with a narrow and organized subset of potentially relevant ESI for their review. While the custodians are able to assist with the review, they cannot impact or control what ESI is identified and preserved; this is controlled and managed centrally by the eDiscovery practitioner. This way, custodians can apply their own insight to the information and even flag personal private data, all while effectuating very cost-effective and systematic ESI collection. TAR features powerful algorithms that cluster documents and otherwise work their magic. CAR also relies on a powerful analytics engine — the human brain. Custodians know a lot about their own documents and emails. This is particularly true in technical or other complex matter where the custodians are engineers or other professionals who simply better understand the dynamics and the nuances of their information. With the X1 process, the custodians provide a key data point, where their input is used to inform the secondary review. The process is very defensible as the exercise is logged and documented, with all metadata kept intact and a concise chain of custody established. Best of all, the custodian-applied tags and annotations are preserved and retained through the review process with X1 integration with Relativity. I could describe this very important feature a lot further, but candidly the best way to get a full picture is to see it for yourself. I recommend that you view this recorded 9 minute demonstration of X1’s custodian self-review feature here. We believe X1’s functionality provides the optimal means for enterprise eDiscovery preservation, collection and early data assessment, especially with the key additional (and optional) feature of custodian assisted review. But please see for yourself and let us know what you think! My previous post discussed the inability of any software provider to solve a critical need by delivering a truly scalable eDiscovery preservation and collection solution that can search across thousands of enterprise endpoints in a short period of time. In the absence of such a “holy grail” solution, eDiscovery collection remains dominated by either unsupervised custodian self-collection or manual services, driving up costs while increasing risk and disruption to business operations. So today, we at X1 are excited to announce the release of X1 Distributed Discovery. X1 Distributed Discovery (X1DD) enables enterprises to quickly and easily search across up to tens of thousands of distributed endpoints and data servers from a central location. Legal and compliance teams can easily perform unified complex searches across both unstructured content and metadata, obtaining statistical insight into the data in minutes, and full results with completed collection in hours, instead of days or weeks. Built on our award-winning and patented X1 Search technology, X1DD is the first product to offer true and massively scalable distributed data discovery across an organization. X1DD replaces expensive, cumbersome and highly disruptive approaches to meet enterprise discovery, preservation, and collection needs. Enterprise eDiscovery collection remains a significant pain point, subjecting organizations to both substantial cost and risk. X1DD addresses this challenge by starting to show results from distributed data across global enterprises within minutes instead of today’s standard of weeks, and even months. This game-changing capability vastly reduces costs while greatly mitigating risk and disruption to operations. Targeted and iterative end point search is a quantum leap in early data assessment, which is critical to legal counsel at the outset of any legal matter. However, under today’s industry standard, the legal team is typically kept in the dark for weeks, if not months, as the manual identification and collection process of distributed, unstructured data runs its expensive and inefficient course. To illustrate the power and capabilities of X1DD, imagine being able to perform multiple detailed Boolean keyword phrase searches with metadata filters across the targeted end points of your global enterprise. The results start returning in minutes, with granular statistical data about the responsive documents and emails associated with specific custodians or groups of custodians. Once the legal team is satisfied with a specific search string, after sufficient iteration, the data can then be collected by X1DD by simply hitting the “collect” button. The responsive data is “containerized” at each end point and automatically transmitted to a central location, where all data is seamlessly indexed and ready for further culling and first pass review. Importantly, all results are tied back to a specific custodian, with full chain of custody and preservation of all file metadata. This effort described above — from iterative distributed search through collection, transmittal to a central location, and indexing of data from thousands of endpoints — can be accomplished in a single day. Using manual consulting services, the same project would require several weeks and hundreds of thousands of dollars in collection costs alone, not to mention significant disruption to business operations. Substantial costs associated with over-collection of data would mount as well. X1DD operates on-demand where your data currently resides — on desktops, laptops, servers, or even the Cloud — without disruption to business operations and without requiring extensive or complex hardware configurations. Beyond enterprise eDiscovery and investigation functionality, organizations can offer employees the award-winning X1 Search, improving productivity while maintaining compliance. X1DD will be featured in an April 19 webinar with eDiscovery expert Erik Laykin of Duff & Phelps. Watch a full briefing and technical demo of X1DD and find out for yourself why X1 Distributed Discovery is a game-changing solution. Or please contact us to arrange for a private demo. It is always gratifying to receive market recognition for your products. At X1, there is major momentum around the X1 Search Virtual product that enables desktop search in virtual desktop infrastructure (VDI), without the need for Windows indexing (which chews up a lot of VDI resources). Because the user experience is key to broader VDI adoption, the X1 Search capabilities complement VDI technology very well. Gartner makes remarks about X1 in the Key Findings and Recommendations section of the report. It is extremely gratifying to get this kind of recognition from the respected analysts at Gartner. Please read the full report to learn what Gartner has to say. The market recognition is coming from customers, too. Check out the compelling case study of a large Federal government DoD agency deploying X1 Search Virtual to provide users with a superior search experience. It’s a great example of customers realizing that end-users need to be satisfied with technology in order to adopt it. X1 Search provides users the ability to search a single, unified interface for content that may live in diverse locations – email, files, network file shares, email archives, Box and SharePoint. With X1’s single-pane-of-glass view of this content, workers can very quickly find the information no matter where it lives. For a complimentary copy of the Cool Vendors in Endpoint Computing, 2015 report, please click here. The Enterprise File Sync and Share (EFSS) category is hot right now. This is not a surprising fact. In the research document Parting Enterprise Users From Consumer EFSS Solutions Will Be a Challenge, Gartner estimates that, “by 2018, 50% of an enterprise’s data will reside external to the data center.” EFSS vendors provide enterprises with more structured ways to collaborate and share information both on-premise and in the cloud. The Gartner document goes on to state that, “an off-premises public cloud implementation of EFSS can help an organization isolate data from its data center and simplify easy sharing of information assets to individuals outside the firewall and located across multiple regions.” For these reasons, EFSS vendors like Box are growing rapidly and gaining large enterprise customers. Obviously, if half of an enterprise’s data will reside external to the data center, then half will still live within the data center or locally on users’ machines. No matter where data is being stored, though, the fact remains that the ability to search that data will be critically important. Workers still demand unified access to their most important information assets, and they want a highly intuitive search experience with fast-as-you-type search results regardless of where the data lives. In other words, users require business productivity search. X1, with the Box connector, provides just that in a way that not only pleases users, but also gives IT a lot of flexibility. With X1’s Box Connector, users can now add Box accounts as data sources, and search emails, files, SharePoint, and now Box content in a single-pane-of-glass. Not only do users get a single interface in which they can search across all of their critical content, but they also get all of the benefits that simply come with X1 – fast-as-you-type search results, full-fidelity document preview, and post-search actions (PSAs). In the case of Box content, the PSAs are valuable because they are specific to things users would normally do within Box. 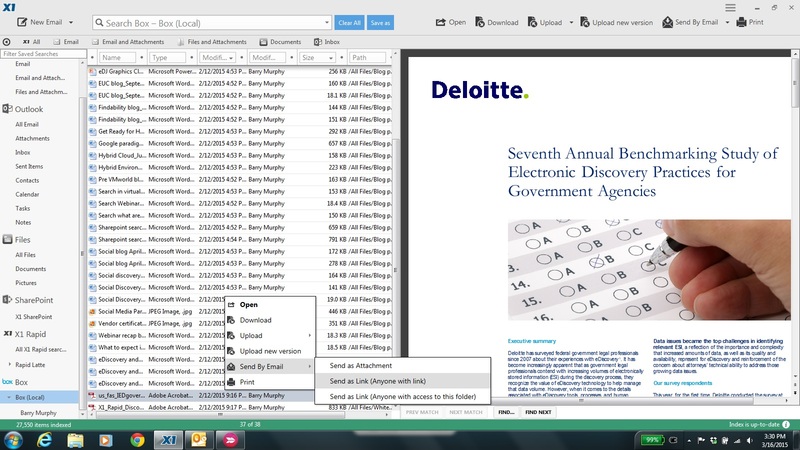 For example, directly in the X1 interface, users can elect to send a document as an attachment or as a link. In addition, users can integrate Box more directly into their personal workflows because X1 will allow a PSA on content from other data sources (e.g. SharePoint) to Box. This is important, as IT organizations like the flexibility that X1 provides in terms of how users can search Box content. 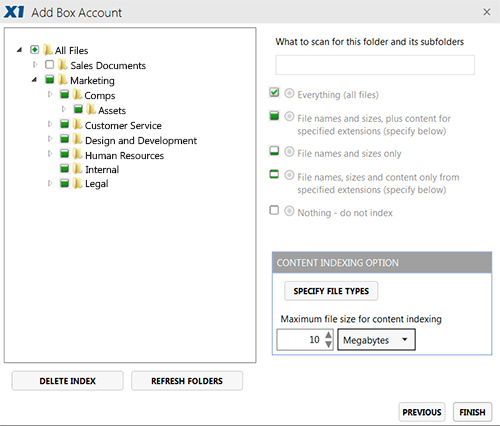 There is an option to index Box documents and store them in the users local index. The content is not stored locally, but the index is, so users get immediate results. Of course, it may not be feasible to have an index stored locally for a variety of reasons, so there is also an option for users to remotely query their Box account without the need to store each item in the local index. IT also has fine-grained control over how indexing takes place. Any solution that makes both end-users and IT happy is a promising one. In this way, X1’s hybrid cloud search capability is a game-changer. As more and more organizations systematically use EFSS vendors like Box, this federated search capability will become even more important. And, the great news is – it’s available right now from X1. So far, beta customers are extremely enthusiastic about the search experience that X1 provides for content in Box. In fact, we strongly believe that no other solution provides this kind of search experience across local and Box content. Customers tell us that they can search and filter through Box content faster than ever before. At X1, we would respectfully challenge anyone to identify a better solution for this purpose – neither we nor our many joint X1/Box customers are currently aware of one. Silent installation of the X1 Search client and other enterprise deployment options are available for large-scale deployments. For more information about enterprise licensing and purchases, please contact info@x1.com.